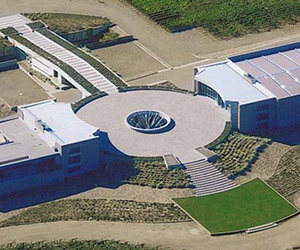 The bodega DiamAndes benefits from an ideal temperate climate, thanks to the altitude, which is ideal for winegrowing. As the winery is located in Argentina’s arid region, the climate is dry and the annual rainfall ranges between 200 and 300 mm. The vineyards stand between 1000 and 1200 masl and the relative humidity is low (between 40% and 60%). In addition, the climate of the area is characterized by the wide range between day and night temperatures, which favors tannin concentration, a paramount condition for the production of high quality wines. 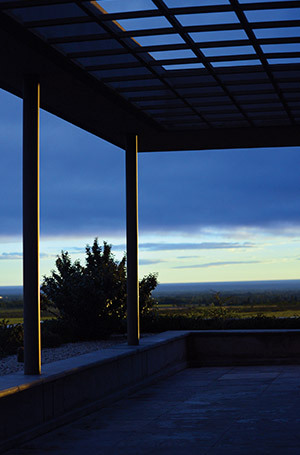 By the Andes Mountains, at 1100 masl, Bodega DiamAndes boasts an ideal terroir: temperate climatedue to the altitude and that together with its sandy-clay soils with large amounts of rock, allow Malbec, Argentina’s king varietal, to fully express itself. The alluvium soil is technically called “sand-silt loam soil” (a balanced mix of sand, silt and clay). This composition can be found in the top one-meter-deep layer of soil, with gravel in the lower layers. Several 190 meter wells have been drilled up to feed an underground aqueduct that allows access to high quality water. 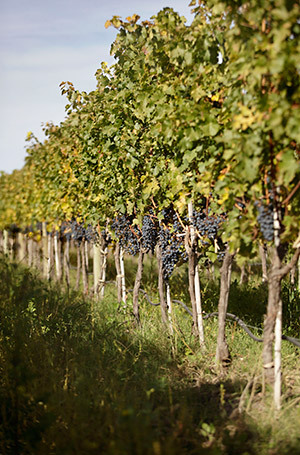 With the advice of Malartic’s technical team, the vine care is based on sustainable farming for a global environment care. It is respectfull of the soils which are ploughed. Several measures are environment friendly: use of natural fertilizers, biodegradation of pestes with rational use of chemical products. Organic waste degradation is made by crushing the shoots. 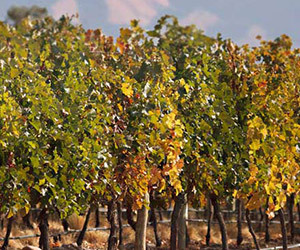 Vineyard health is usually very good due to the low rainfall levels. As a result, little phytosanitary treatment is required. Vines are trained by means of espaliers and rows are oriented from North to South. Vineyards are planted with a density of 5500 vines per hectare (2227 vines per acres) and the double Guyot and spurred cordon pruning systems are used. 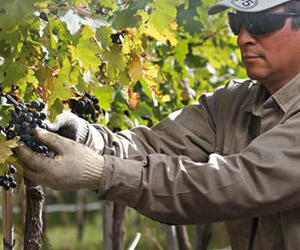 At the vineyard, everything is done manually to ensure the best quality of the fruit. A rational use of water: A drip irrigation system is used and this strategy is based on the concept of sustainable water deficit. The water is pumped at constant pressure into each parcel, and this allows for customized water management. Weather station and pressure chamber allow us to follow the water stress condition of the vine so that it ensures the best condition of irrigation decision taking. In the case of the red varieties, water deficit is applied early in the season, that is, between berry set (nuaison) and veraison with the purpose of controlling vegetative growth and reducing berry size, thus achieving greater aromatic and polyphenolic concentration. Likewise, cluster thinning (vendange en vert) takes place during veraison to ensure even sun exposure and regular distribution of berries. 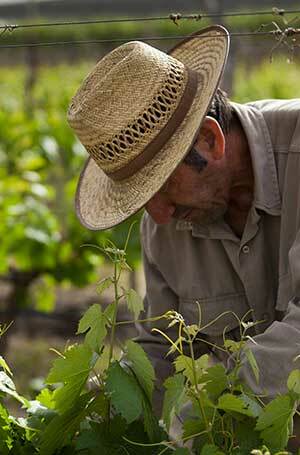 White Varieties: 7 hectares (17 acres) are planted with 72% Chardonnay and 28% Viognier.